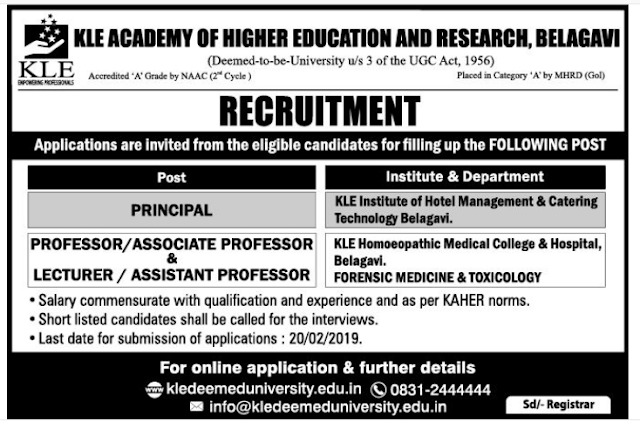 KLE Academy of Higher Education and Research, Belagavi has advertised in the DECCAN HERALD newspaper for recruitment of Professor / Associate Professor / Assistant Professor / Lecturers / Principal jobs vacancies. Interested and eligible job aspirants are requested to apply on or before 20th February 2019. Check out further more details below. College Profile: The extreme shortage of medical facilities in the region, promoted the KLE Society to establish the Jawaharlal Nehru Medical College at Belgaum in 1963. The J N Medical College, Belgaum, stands testimony to the high professional standards aimed for and achieved by the KLE Society. Under the able guidance and mature insight of the Founder Dean, Late Dr. B.S.Jirge, the foundation of the present academic vastness was laid. Eminent medical educationist, late Dr.B.S. Desai and Dr. M.Basavaraj Urs headed the institutions as principals during the first decade. How to Apply: Interested and Eligible candidates may send their resume along with recent passport size photograph, copy of Aadhaar card, copy of PAN card and necessary documents to the Email address.